Please note that our Reserve & Collect service is only available to customers flying to Åland or destinations outside Finland. A fruit chewy bite-sized candy with a colorful candy shell, Skittles candies have been enjoyed by fans for decades. Today, over 200 million Skittles candies are produced on a daily basis. 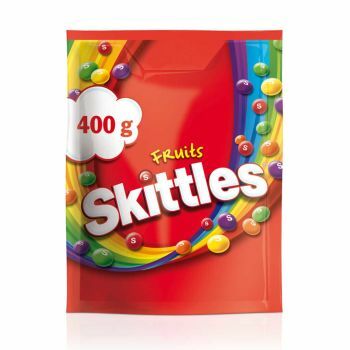 400g of Skittles Fruits flavored candies in a handy pouch. Share the Rainbow, Taste the Rainbow. Exclusively available in travel retail.